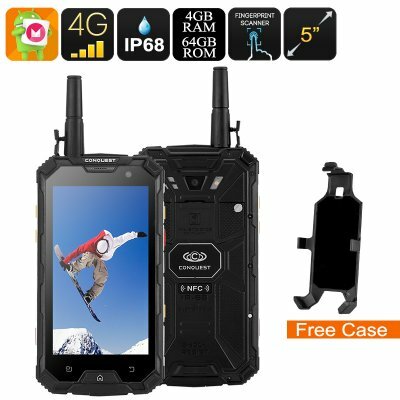 Successfully Added Conquest S8 Rugged Phone 2017 Edition - 4G, Android 6.0, IP68, GPS, IR Transmiter, Walkie Talkie, Octa Core CPU, 4GB RAM (Black) to your Shopping Cart. Ready and reporting for action! The New Conquest S8, 2017 edition is equipped to accompany you on any adventure. The rugged exterior of this phone brings an IP68 waterproof and dustproof rating, the reinforced body brings shockproof protection and it can also withstand pressure and extreme temperatures. Add to that the scratch resistant Corning Gorilla Glass 4 screen and you have one tough rugged smartphone that can go and operate almost anywhere. This Conquest S8 2017 smartphone is an almost indestructible gadget that is tailored to the outdoor worker or adventure seeker and can withstand the hardships and tough conditions of a building site or alpine peak. In short, the S8 is built like a tank. This superior rugged phone has an Octa-Core CPU clocked at a respectable 1.8GHz and 4GB of RAM. This means it's well equipped for any of your smartphone needs and will handle games, media and web browsing without any issues. It has the Android 6.0 Marshmallow OS so you'll get a familiar and intuitive user interface. A large 5 inch IPS display serves up 1080P resolutions so you'll get great detailed viewing that's easy to view even in bright sunlight, with the Gorilla Glass coating the screen will be well protected from scratches and drops so you'll feel happy using it outdoors. There is 64GB of onboard memory and this can be extended via a micro SD card slot. The included mini screwdriver tool provides access to the Dual SIM slots as well as that chunky 6000mAh battery. 4G support across a wide number of frequencies help you connect to the fastest mobile networks in most regions of the globe so staying connected couldn't be easier. A Push to Talk walkie talkie feature allows communication over UHF network at 400 to 470MHz. This ensures that you're never truly cut off from the world and even without a phone network signal you can communicate over distances of 5kilometers. The 6000mAh battery will be enough for long weekends away and provided enough power for up to 600hours in standby. With OTG you can tap into this power reserve to recharge your other gadgets. Packed full of sensors the Conquest S8 smartphone will make navigation easy with its compass and GPS functions and can even tell you the current temperature along with other barometric readings. NFC lets you use the phone for secure Android payments while the infrared transmitter gives you the power to remotely control your TV, Air con and other home appliances direct from the phone. A 13MP rear camera, Bluetooth 4.0 connectivity and FM Radio round out the list of great features on this rugged Android phone. The Conquest S8 2017 edition comes with a 12 months warranty, brought to you by the leader in rugged phones as well as wholesale Android smartphones.. Came to Kansas with some charge on in it put my T-Mobile sim card in went straight to 4G coverage. Great picture. Paid the extra shipping very cheap to get it in 5 days...work days.